Safety is all about results. There have been zero reported accidents on our installations both while in use and during construction. Our company’s MOD rate is constantly below 1.0. 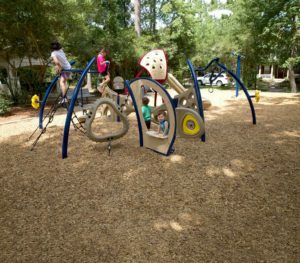 American Playground Company has the industry’s leading safety program. All of our products exceed the safety performance standards established by the ASTM, CPSC, CSA and EN. Just as important, our staff understands creating a safe work environment and a safe place for our children. Every American Playground installer is required to obtain the below certifications within their first year of employment. American Playground requires their employees to obtain twelve unique industry specific safe practice certifications that focus on construction means and methods. Our company has a full time safety director that daily inspects sites under construction and completed projects to assure we are meeting all safety standards. All of our team members must participate in a drug free workplace by participating in a new hire drug screen and monthly random screens. In addition, all new hires must participate in an ability test to assure they can safely perform their position requirements. During their onboarding, all new team members will go through an extensive new hire safety orientation program. This is just a glimpse of our safety program. Upon request, American Playground Company would be proud to share with you our full multifaceted safety program outline.